Several short slot canyons wind through the light colored Entrada sandstone rock along the west edge of Lake Powell - one typical example is Blue Pool Wash, actually quite a long drainage which is a sandy wash for most of its length, flowing from the high cliffs at the edge of Cedar Mountain in Arizona across a flat plateau, then deepening shortly before the junction with Wahweap Creek where it forms several moderately deep narrow sections interrupted by dryfalls. 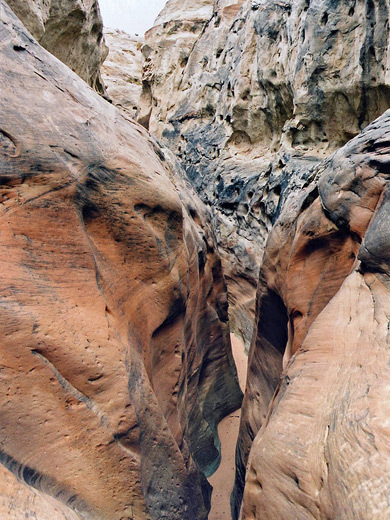 The narrows begin just as US 89 crosses the wash, so the canyon is very easily accessed and can be explored in an hour, though ropes are necessary to descend the whole length. 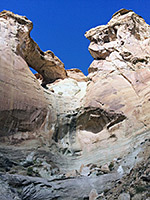 Also of interest nearby is Blue Pool Arch, a sizeable feature on the south side of the mesa to the west of the highway bridge, a little less than one mile from the slot canyon. The arch may be reached by walking upstream along the wash to the point where a 4WD track crosses the streamway, just before a fork in the drainage, up this track a very short distance to a junction, then northwestwards along a lesser track to the end of a protruding ridge. 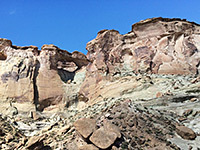 The arch is a little way along the left (west) side of the ridge, high up, on the rim of the mesa. 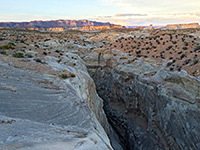 The wash passes under highway 89 in Utah between mileposts 3 and 4, about half way between Big Water and the northern turn-off for Wahweap Marina. There is a parking area along a dirt track on the southwest side, just south of the road bridge; the track continues westwards to the vicinity of the arch. TopoQuest topographic map of Blue Pool Wash. The wash enters a canyon about 200 feet upstream of the bridge, dropping over two small dryfalls then a bigger one directly underneath the highway, formed by a boulder on top of the remains of an old car that was presumably once pushed over the bridge - not an uncommon sight in canyons under bridges, eg Water Holes Canyon and Bull Valley Gorge. 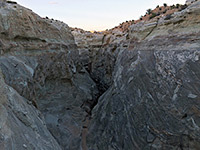 It isn't easy to climb down without a rope so a better point to enter the canyon is on the other side of the road, down a slickrock slope on the southeast side, though again the canyon downstream soon reaches another sheer fall, beneath a chokestone. Ropes may be left in place here. There do not appear to be any re-entry points but the lower end of the wash can be reached by walking along the southeast rim then scrambling down the steep cliffs that form the sides of Wahweap Valley. Once the waters of Lake Powell flooded the valley all the way to Blue Pool Wash but they have long since receded and now the floor is covered by bushes, sand dunes and mud flats. 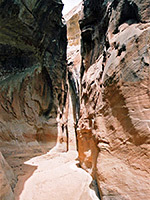 The lower end of the wash soon narrows sharply before being blocked by a high dryfall, also with a rope attached at the top end. Curvy reddish rocks rise high above and in general the canyon is nice enough though not especially interesting. There are other short slot-like tributaries in the vicinity on both sides of Wahweap Creek, but none are very narrow or deep.